A visit to a Dutch fair, so I write this article in Dutch. Afgelopen zaterdag naar de DvRA in Apeldoorn geweest. Omdat ik erg vroeg was had ik geen parkeerproblemen en kon zelfs dichtbij de Americahal parkeren. Het hoofddoel van deze dag was het bemannen van de CGR stand. Ondanks dit was er tussendoor de gelegenheid om over de beurs te lopen. Mijn aankopen tijdens de DvRA. Thuisgekomen met een Cuna SR9. Met deze ontvanger is in 1984 mijn hobby begonnen. Een 160GB externe hardddisk + het boek "Stealth Antennas". Het begrip "Stealth" in dit boek is ruim genomen. 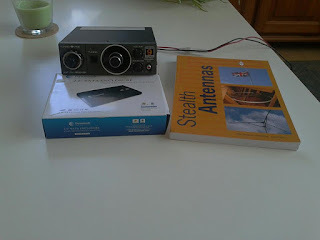 Zo worden er ook portabele antennes voor in de tuin besproken. Weer een leuke dag, ondanks dat het na mijn mening een stuk minder druk was. Handelaren komen ook minder. 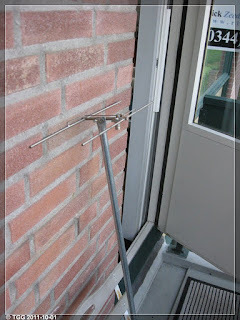 A few week ago, during my holiday, I removed my 6M antenna from the balcony. On that moment I thought the Es season for 6M was over. Until this moment I'm right. This Es season I made the first qso on May 9, it was with HA8CE in KN06EN. On August 8, I made my last Es qso. In this period I worked 9 DXCC countries. All qso made with 5 watts, SSB or CW, from the Yaesu FT817nd. 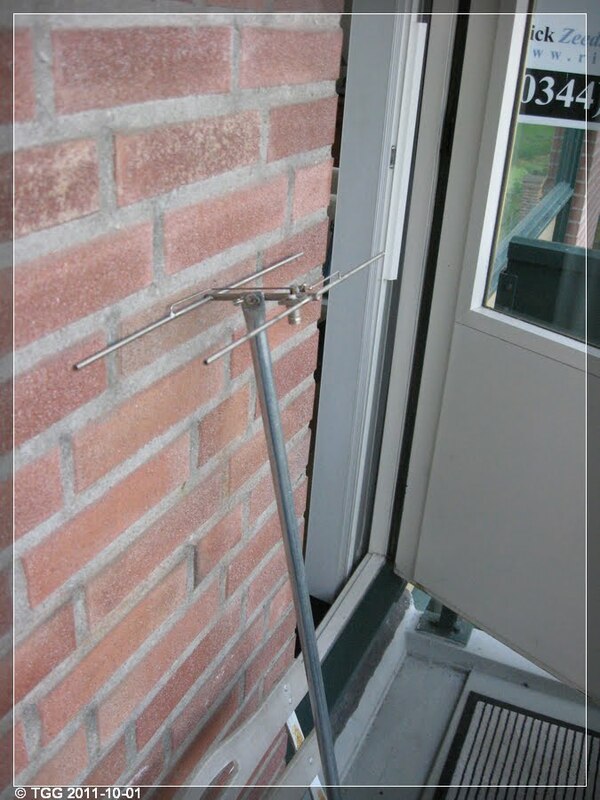 Antenna: a 1/4 wave on a metal table on my balcony. Today between 11:00 and 15:00 local time I had to stay home to receive any visitors. This because my apartment is on sale. The bad economic situation and possible also the nice weather played tricks. There was no visitor to watch my apartment. Because the weather was fine I just want to go out. With my FT817nd and a HB9CV for 70cm I drove to my regular location in the field, JO21QW. Meanwhile I saw on the internet that there was a contest at 70cm, more activity. Arrived on the location I putted my FT817nd on the wary shelf and connected the HB9CV, voltage from the internal battery. Antenna in one hand and and mike in the other one. To my amazement, I worked between 15:30 and 16:00 UTC 4 stations. I had a clear view direction east and direction South / West looked the antenna against a dike. My HB9CV for 70cm, photo on my balcony.